As the NRC starts looking over NuScale’s application to certify the company’s first-of-its-kind “small modular reactor” design, it’s worth looking back at how we got here. It’s also useful to look at the steps we’ll follow going forward in our technical review. NuScale’s application is the first to propose a nuclear power plant designed with several small reactors instead of one large one. The company has discussed this approach with us since 2008, using much the same “pre-application” process followed by makers of traditional large reactors. 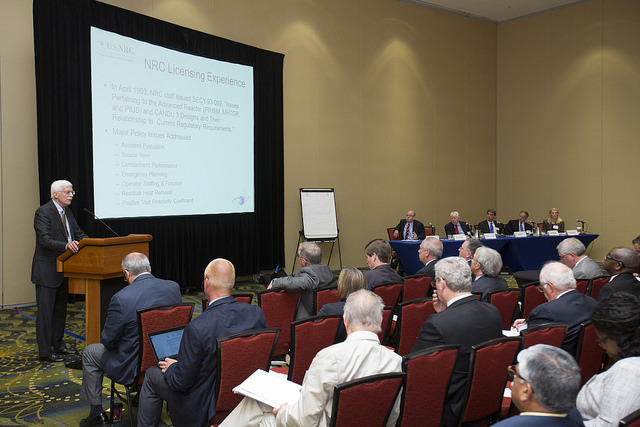 These talks helped both the NRC and NuScale understand where the design might need additional supporting information or alternative approaches to NRC policies. For instance, NuScale examined how its design could best meet the NRC’s requirements for staff in the control room. The NRC also used information from NuScale in developing a design-specific review standard. This ensures the agency’s technical staff has specific guidance on the requirements NuScale must meet to get the novel small modular design approved. The standard covers topics such as instrumentation and controls, cooling the reactor core in an emergency, and the materials used for the reactor vessel and steam generator. The NRC published the draft review standard in July 2015 and after public comment, issued the final review standard in August 2016. The application itself is a collection of electronic files that must be transferred into the NRC’s document database, ADAMS. This process ensures the agency staff can refer to a constant set of information during the review. It also allows the public to view any documents not subject to withholding for security or other reasons. The agency expects all the NuScale application documents will be transferred by mid-January. Michael Johnson, NRC Deputy Executive Director for Operations (right), and Vonna Ordaz, Acting Director of the Office of New Reactors, (second from right) receive NuScale’s application from NuScale Chief Nuclear Officer Dale Atkinson (second from left) and NuScale Vice President for Regulatory Affairs Tom Bergman (left). Once the NRC has all the pieces of the NuScale application, the staff will first check if it contains enough high-quality information for us to do detailed technical reviews. If it doesn’t, NuScale can provide supplemental information. If it does and we find the application acceptable for a full review, we will publish a notice in the Federal Register. We expect to make our acceptance decision by mid-March. Once we complete our full review and get feedback from the Advisory Committee on Reactor Safeguards, the technical staff will decide whether NuScale’s design is safe and appropriate for U.S. use. If the answer is yes, the staff will offer the Commission a draft rule to add NuScale to the list of approved designs. The public can comment on draft rules to certify new designs. We expect the design certification review to last about three years, assuming NuScale completely answers any NRC questions in a timely manner. This exacting review ensures the staff can make a fully informed decision that protects public health and safety. A certified design is considered safe and appropriate for U.S. use; the NRC has certified six reactor designs to this point. Companies interested in using certified designs must apply for separate licenses before reactors can be built and operated. Today’s conversations about powering civilization in the future often propose carbon-free energy sources. In addition to solar and wind, these conversations sometimes touch on advanced nuclear reactor designs. Designers have yet to submit any of these designs for NRC review, but we expect applications in the future and we’re preparing for them. These technology approaches range from evolutions on proven technology (such as high-temperature gas reactors) to innovative concepts that would re-use the “waste” nuclear fuel from today’s reactors. Jennifer Uhle, second from left, participates in the panel. I recently took part in one of these discussions at the Third Way group’s first Advanced Nuclear Summit and Showcase at the Newseum in Washington, D.C. The NRC contributed to the summit due to its focus – what can agencies and legislators in Washington do to support development of advanced nuclear designs? The NRC’s only role is ensuring these designs meet stringent safety standards. My portion of the discussion involved the NRC’s review of reactor designs to meet our mission of protecting public health and safety. As I told the audience, we carry out that work as efficiently as possible so that the NRC avoids becoming a roadblock to deployment of appropriate technologies. The NRC’s looking ahead to potential applications for reactors cooled by something besides water. Our limited advanced reactor budget includes work to stay up to date on this “non-light water reactor (LWR)” technology development. Vendors are considering many non-LWR technologies for future licensing work. We’re taking a technology-neutral approach to stay properly positioned to efficiently review whatever vendors submit. The summit also attracted non-LWR designers, venture capitalists, the Department of Energy, national laboratories, industry groups, universities, media, and think tanks, such as the Clean Air Task Force. Members of Congress attended the summit to discuss proposed legislation related to nuclear power. Advanced reactor designers told the audience they’re targeting deployment in the 2020s to the 2030s, depending on where their designs are in development. The NRC’s preparation for potential advanced reactor applications includes our ongoing partnership with the Department of Energy. DOE’s support for research and design activities will help vendors gather the information they need for their design applications. The next milestone in that partnership will be our second advanced non-light water reactor workshop, currently scheduled for June. This workshop will present DOE’s strategies to support the development, and NRC’s plans for efficient licensing of advanced reactors.